McDonald's and the International Olympics Committee (IOC) are ending their long-running sponsorship deal three years early. The fast food chain said it was "reconsidering all aspects of its International Olympics Committee business" as part of a plan to re-invigorate its business. The IOC said it understood "that McDonald's is looking to focus on different business priorities". The partnership began in 1976. "For these reasons, we have mutually agreed with McDonald's to part ways," said the IOC. 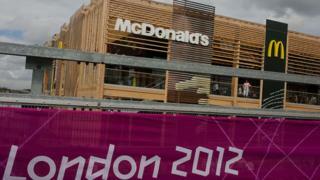 McDonald's had extended its sponsorship agreement with the Olympics in 2012 for a further eight years. As a "Top Partner", it paid a reported $100m for each two-game deal covering the summer and winter Olympic Games up to and including 2020. McDonald's partnership with the IOC will end immediately, but it will continue to be a sponsor of the Olympic Winter Games PyeongChang 2018. The IOC said on Friday: "The financial terms of the separation was agreed by all parties, details of which are confidential." A number of companies have ended partnerships with the Olympics recently, including AB InBev's Budweiser, the hotels group Hilton and US telecoms giant AT&T. McDonald's has been restructuring its business to arrest a decline in sales. Steve Easterbrook was appointed as chief executive in 2015 when he said he would "not shy away from the urgent need to reset this business". Commenting on the "mutual" decision to part ways with the IOC, Silvia Lagnado, global chief marketing officer at McDonald's, said: "As part of our global growth plan, we are reconsidering all aspects of our business and have made this decision in cooperation with the IOC to focus on different priorities." The IOC said it has no immediate plans to appoint a direct replacement in the "retail food operations sponsorship category" which will be reviewed.